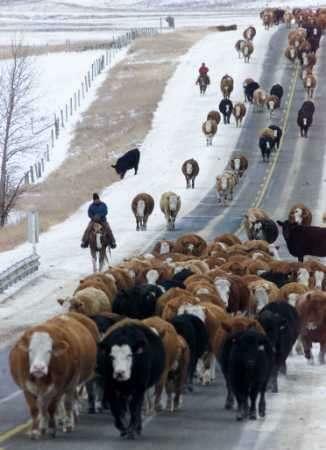 John Lamb (foreground) and his son Dustin Lamb, move 300 head of cattle along Alberta highway 566 near Balzac, December 31, 2002. The Lamb family and the Church family move the cattle 12 kilometres to the Lamb ranch north of Calgary and have been moving the cattle along the same route for the past 12 years. They began with 500 cattle in 1991, but many have died along the way due to the slow pace and dangerous roadside travel.